As I drove away from work, I had only been in my car perhaps three minutes when the dark gray clouds above me sent a great flash of lightning and the sound of thunder so great and consuming that I instinctively crouched down in the driver’s seat, clinging to the steering wheel. 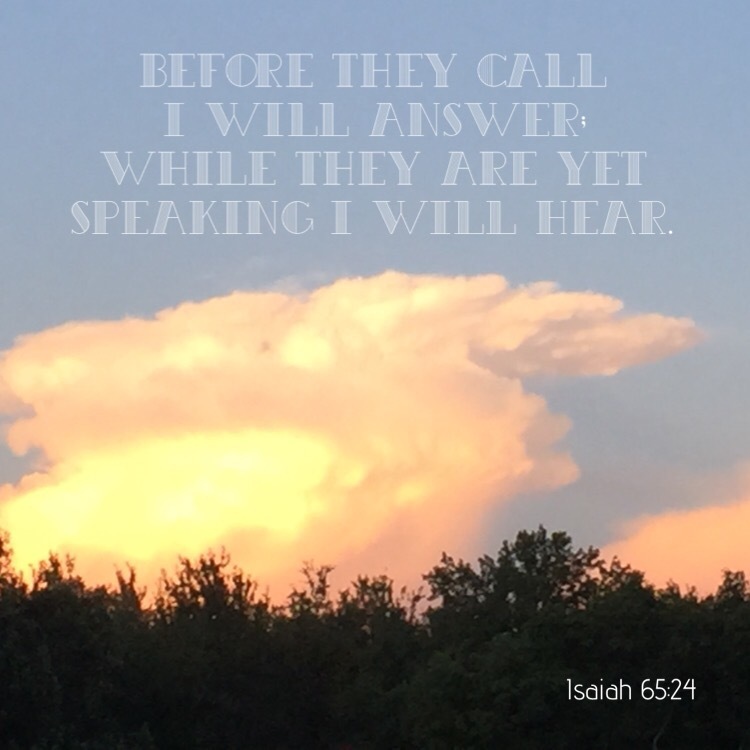 It was like a heralding trumpet, announcing the great storm to come…. Driving only a small distance on the highway, the torrential rain began. It was difficult to see the lane markings as I crept along at a slow speed with my tires throwing up waves of water from the pavement beneath me. Once, a vehicle passed by and the deluge of water from their tires arriving on my windshield stole all vision of the road from me. As I made my way down the six lane highway, the radio announcer related weather warnings completely accurate to my situation. The thought occurred to me that for so people, everyday life is a struggle, like trying to drive through a storm. People who do not know Jesus have an obscured view of life. As troubling situations arise, the road ahead is difficult to navigate alone. It’s hard to navigate through each day when they’re experiencing the storms without God’s guidance and direction. That man you see, that woman you see—that grandmother or grandfather–that child—that person who doesn’t know Jesus as their Savior—they are stuck in a storm. They want to hurry and find a way out, but they don’t know how to begin. Those of us who know Jesus can start by talking to them. Talking to them about God and His Son, Jesus. 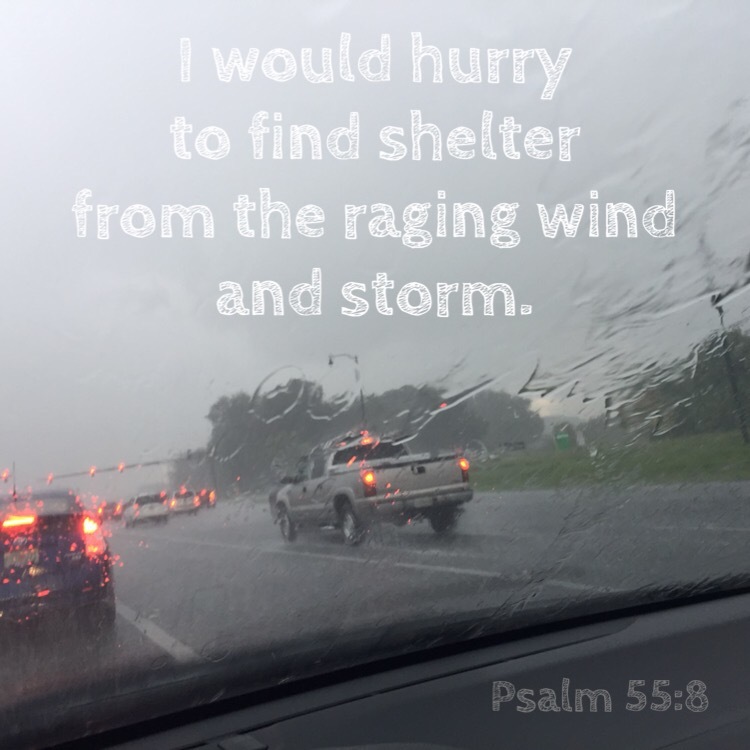 They don’t have to remain on a stormy, six lane highway with their hands gripping the steering wheel. It can all change—the moment they believe. Who can you talk to today that’s struggling in the storm? Isn’t it strange that one day we can be excitedly happy and the next day be quiet and reflective? Most of my days I find that I am somewhere in the middle. Today, I am on the quiet, reflective side. 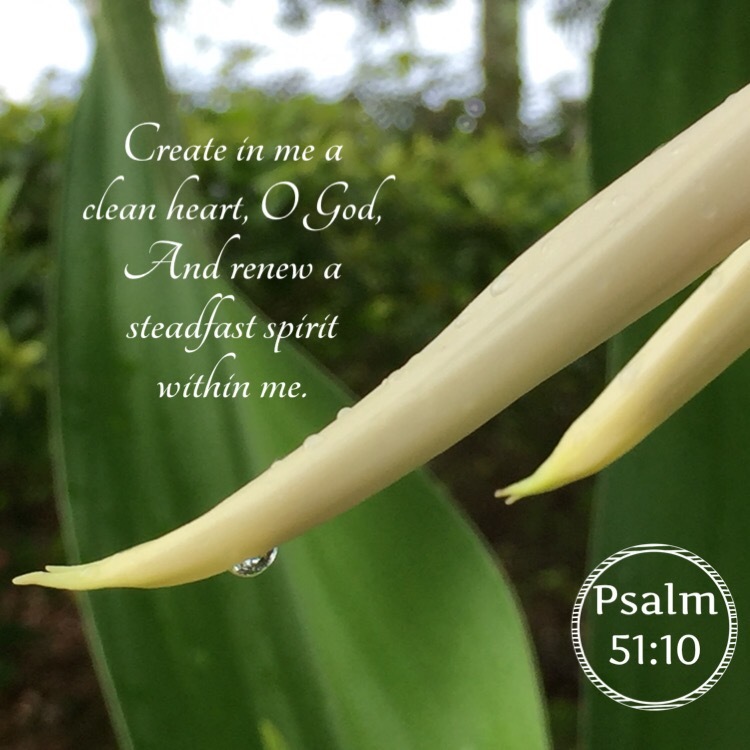 As I read Psalm 100, verse three stood out to me. 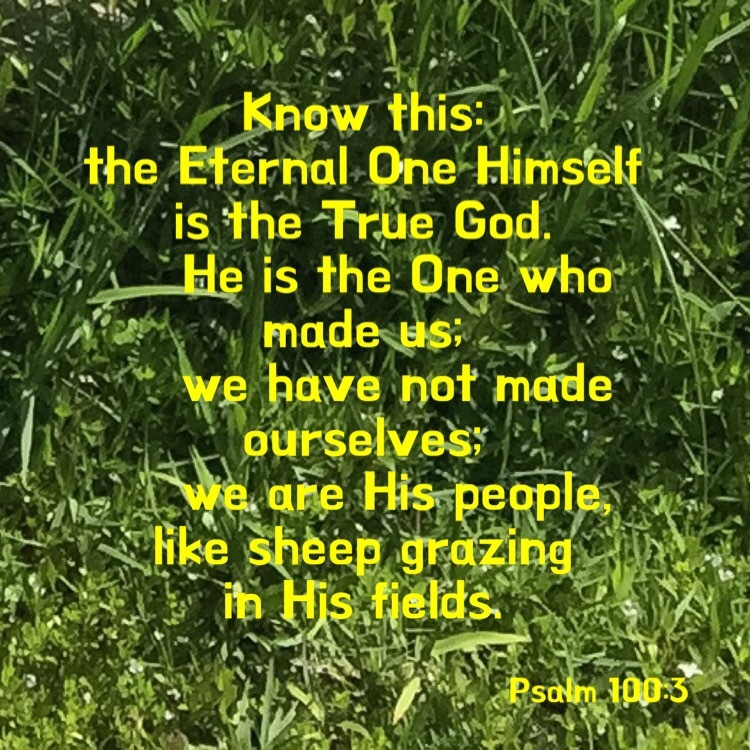 Picturing myself as a sheep, out on a field with other sheep is a comforting thought as I continue to think about the fact that Jesus is my owner and shepherd. If a wolf came near the flock, my Shepherd would protect me. If I was in danger of walking to a dangerous place, my Shepherd might use His staff to move me back to safety. If I was thirsty, my Shepherd would guide me to water. When I think of sheep, I imagine animals that do not seem stressed. And all the rest of His sheep, too. I read Psalm 125 tonight. I purchased a couch throw to place on a chair in my living room this past summer. Wanting something to have wrapped around me as I rested in the chair, I found the perfect thing at a store. 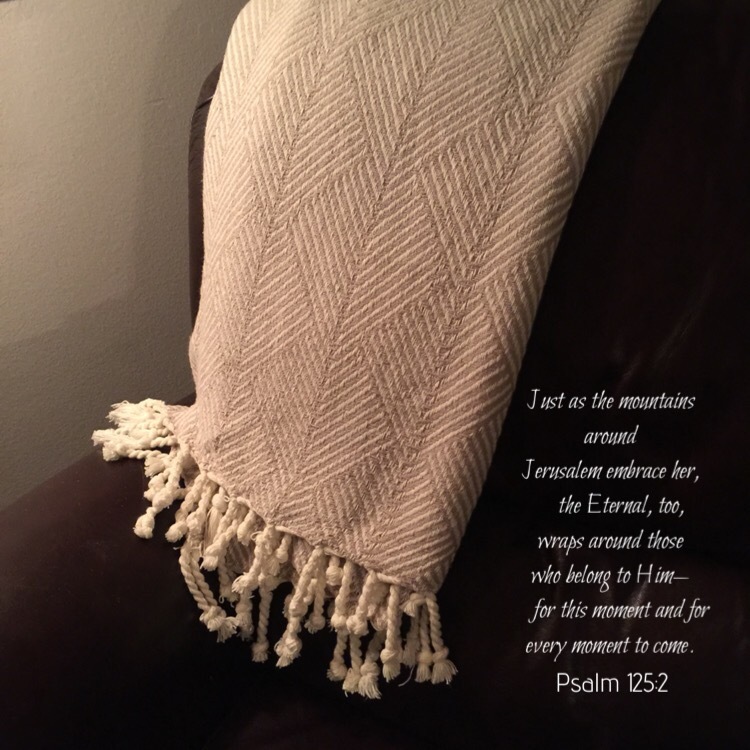 When I think of being wrapped, it’s easy to think of this woven piece of cloth keeping me warm. God wraps around me as the mountains wrap around Jerusalem, because I belong to Him. For this moment and every moment to come. Many people are concerned about the education of their children. They want them to go to the best schools. They want them to have good teachers who are knowledgeable, as well as kind and understanding. They want a solid curriculum with adequate preparation for living in society and attaining a productive career. As children get a bit older, some of them begin to feel this way about their own education. Applying themselves to their studies, they look toward the future and the positive outcomes a good education will avail. How important is it to us to know the ways of the Lord? 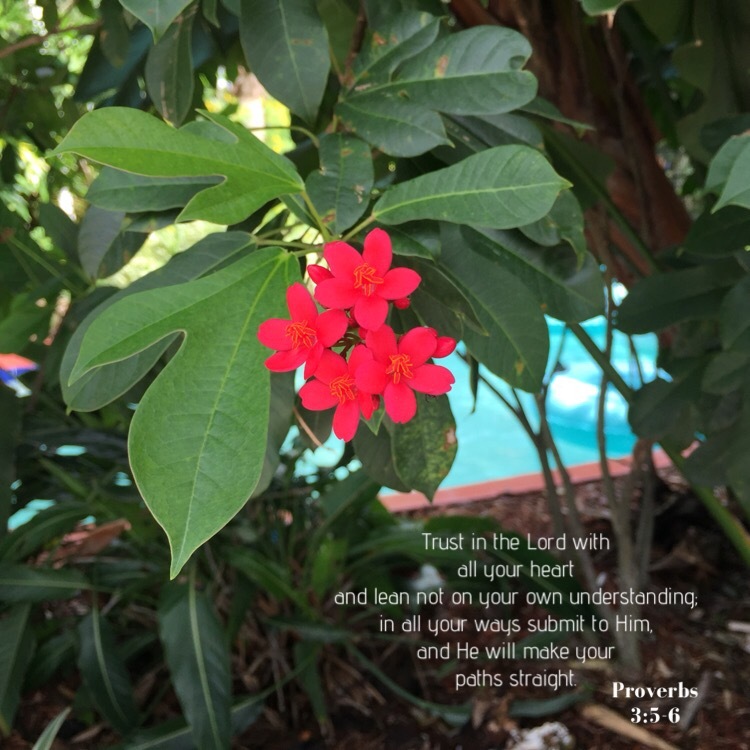 How important is it to us to have the Lord teach us His paths? How important is it to have the Lord lead us in His truth? Do we long to have this spiritual “education” from the Lord for ourselves and our children? In light of eternity, it will not matter what college we have graduated from. Our vocational skills here on earth will not be of great significance when we die. Our relationship with God and our salvation through Jesus, His Son, will be the most important thing then. Shouldn’t it be the most important thing now? 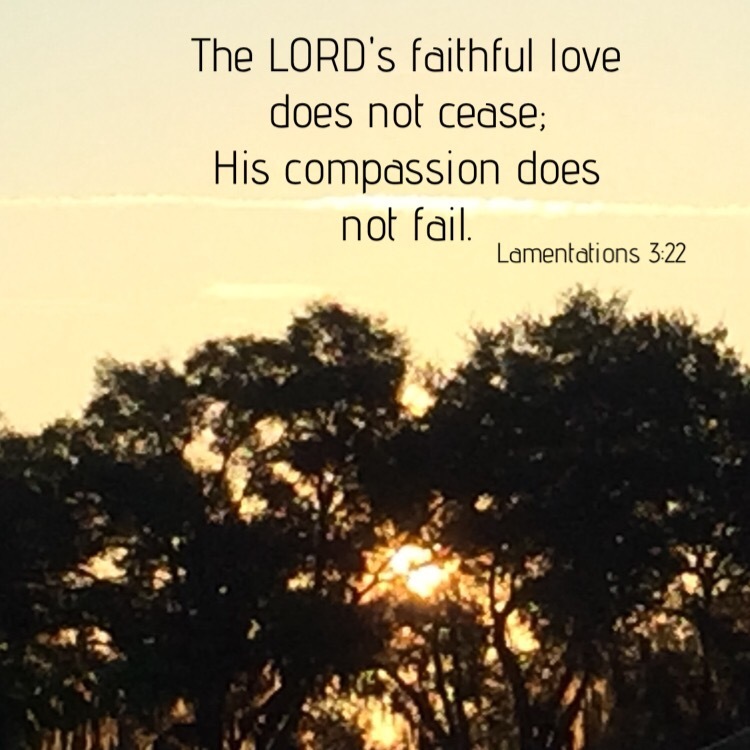 The LORD’s faithful love does not cease; His compassion does not fail. Walking along by the water, the image on its still surface drew my eyes toward it. The blue of the sky, the green of the leaves on the branches—all displayed in a natural mirror. A troubled heart can be calmed. A restless mind can be quieted. A sleepless night can be changed to one of healing rest. A broken life can be made whole again. This morning as I walked out to my car to drive to work, the sun had not yet come up. The day was bright with the sun’s approach, however. As I started to get into the car, I could see a giant cloud, blazing with glorious hues of orange, yellow and pink in the western sky. Putting my things in the car, I photographed the cloud with my phone. Even though I couldn’t see the sun directly, I could see it’s illuminating effect on the billowing mass of water vapor that rose so high in the distance. It was a testimony of what was soon to come into view. I have been praying about many concerns lately. God knows about them all. Even though I may not see how God is working in a particular moment, there are times when I can see His light shining on a situation. It is a testimony of His faithfulness and answered prayers to come. I frequently shop at a grocery store near my workplace. This particular store has carts lined in the front and secured by chains. In order to get a cart, a customer must put a quarter in a slot connected by the chain. When the quarter is inserted, the cart is freed for use. 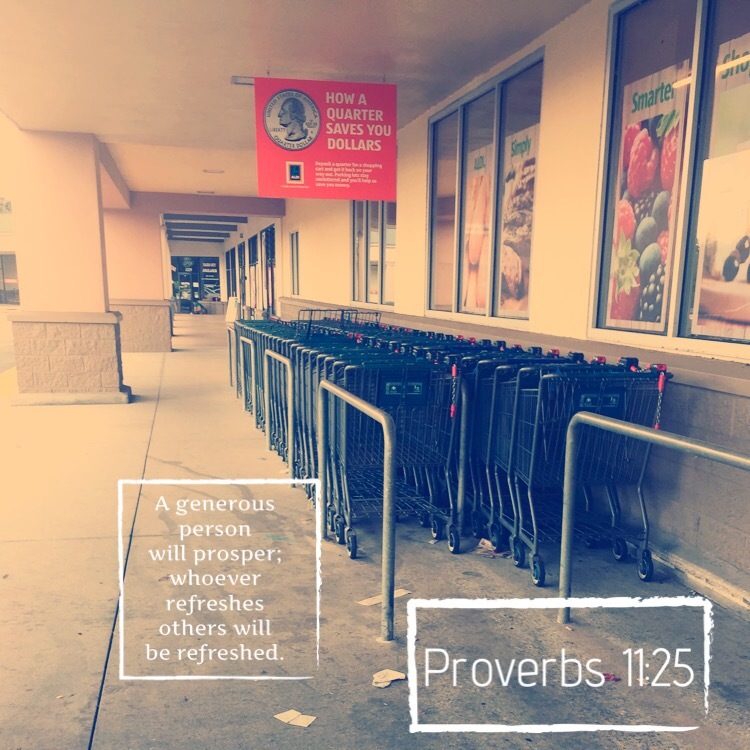 When the cart is returned after shopping and the chain is connected again, the quarter is automatically refunded to the customer. Today, as I was leaving my car in the parking lot to go into the store, a woman called to me. She had an empty cart she was returning and she wanted to give it to me. I tried to give her a quarter, but she wouldn’t accept it. Instead, she told me to pass it on to someone else. The LORD values those who fear Him, those who put their hope in His faithful love. The only hope that I have is in God. He is the only hope that I need. His love for me is continuously faithful. All my concerns are before Him. 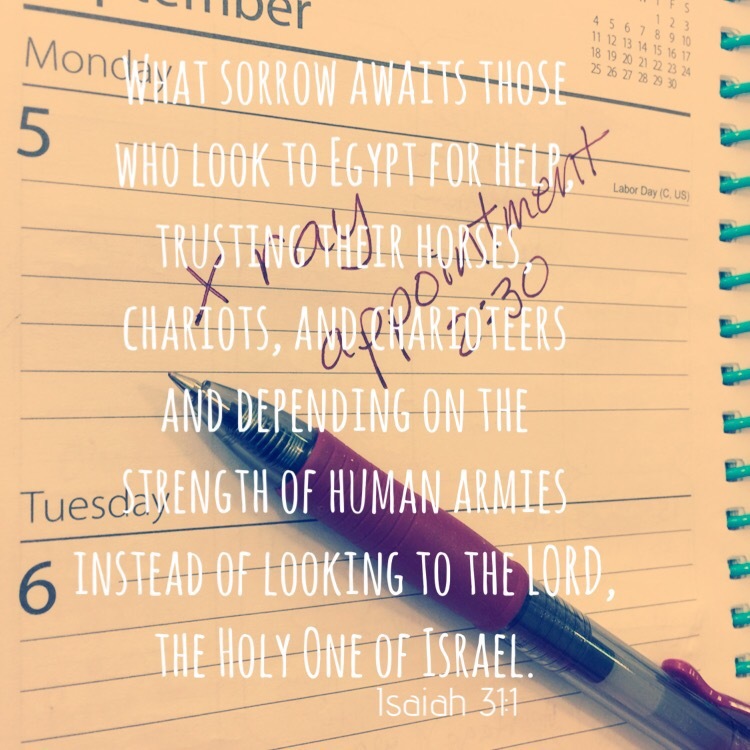 What sorrow awaits those who look to Egypt for help, trusting their horses, chariots, and charioteers and depending on the strength of human armies instead of looking to the LORD, the Holy One of Israel. 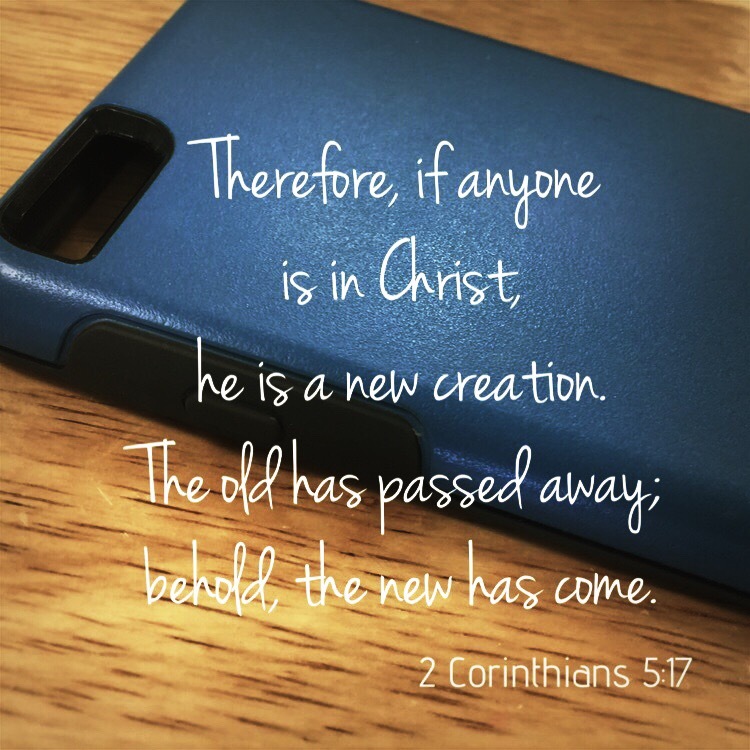 When I read this passage of scripture, I think of who I am looking to. Although I think that it is certainly good to seek out a doctor when illness strikes or a plumber if a pipe breaks beneath your sink, talking to God about every situation is very important. If I am sick, do I put my TRUST in what the doctor can do alone? Or do I pray and ask God to work healing in my condition? If a pipe breaks under the sink, do I pray and ask God for wisdom in what to do right then and what plumber I should call to help? God is ready and willing to be the first to hear from you about absolutely every need that arises. If we do not consider Him able to help us, but focus instead on the strengths and expertise of other people as our sole means of help, we do ourselves a great disservice. God is the only healer. God is the only true provider. Looking to God first in every situation is always the best decision. Matthew West has written a song that I hear quite often on the radio. Have you ever felt that there was a conflict going on inside you concerning guilt and its relationship to forgiveness? There may be someone you know who feels so guilty about a situation they can’t seem to grasp the fact that God is willing to forgive them. This forgiveness—our salvation and redemption—is a gift from God. There is nothing we can do to earn it. Instead, we must only accept it. 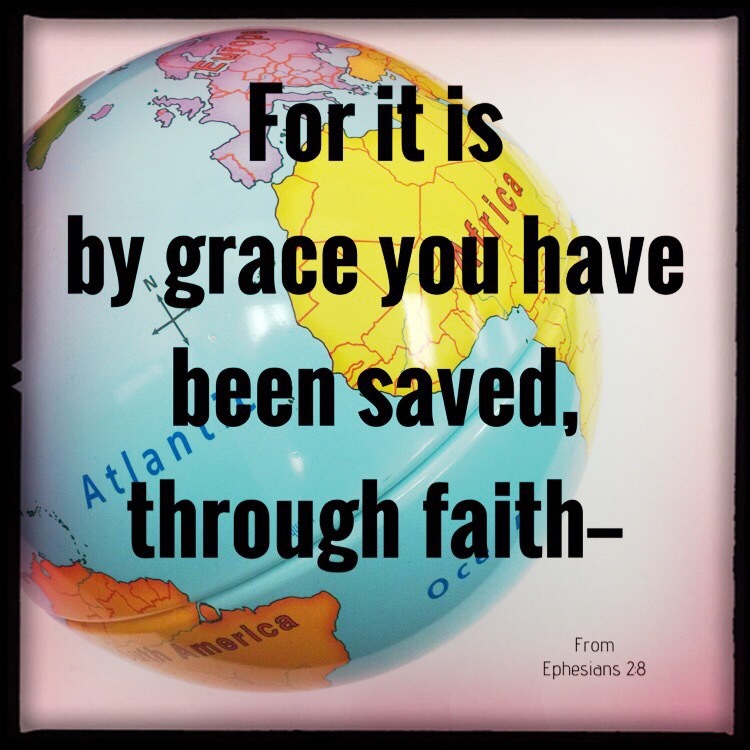 As believers in the world, each one of us is living proof that grace is victorious through the sacrifice of Jesus. Just a couple of days ago, I downloaded a new operating system for my smartphone. I had learned about its availability and the positive things it had to offer. In making the decision to begin the download, I was aware that with the new operating system in place, there would be some changes that I wouldn’t be used to. The way that things had been would not all be the same. Some aspects of the system would be improved upon; some would be completely new and still others from the previous system would have been deleted all together. Although change is good, it is sometimes difficult to take that first step to incorporate it. Many years ago, I received a new spiritual operating system—one that changed me completely. My old way of living was becoming such a burden to carry. Things just hadn’t turned out the way I had planned. Even though I felt that I was in control of my life, my decisions weren’t always productive and many times they were harmful. With my level of discontent and disappointment, I knew that things needed to change. When I came face to face with the choice to allow Jesus to become my Lord and Savior, I was ready. Ready to get rid of the old way of operating my life. Ready for a new operating system—one where God was in control and guiding me. Asking for forgiveness of all that I had done to displease Him and asking Him to become the Lord of my life, I changed. God did come into my heart that day. It was the most important decision of my life. Are you tired of operating on your own through every moment, every hour of your day? God is ready to change all that. Today I saw a message on a t shirt someone was wearing. I have to admit, I pondered this statement for awhile, trying to discern all the implications of the words. In a negative and proud context leaning toward always thinking better of yourself than others, remembering an invisible crown would not be in anyone’s best interest. 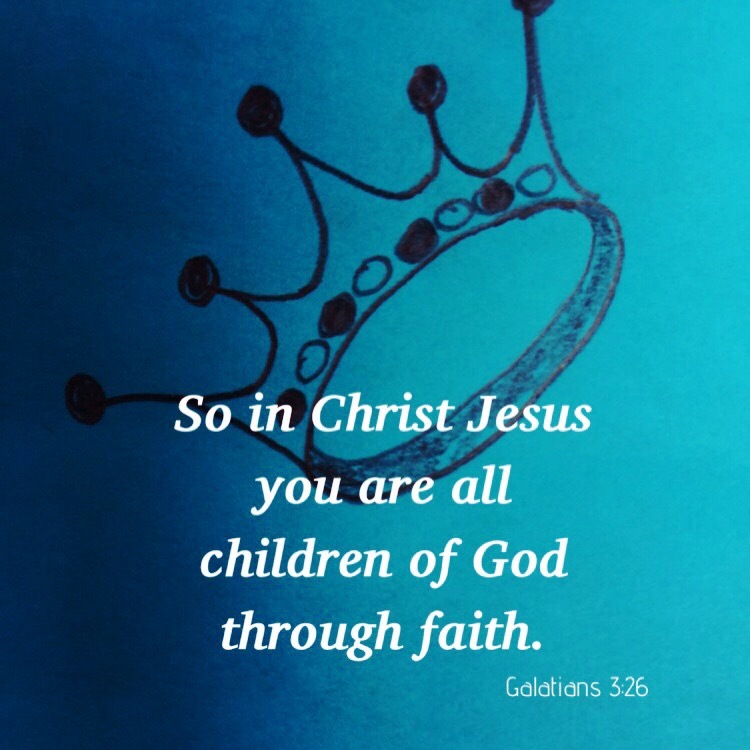 In a positive and humble context leaning toward always thinking of yourself as someone who is loved by God and forgiven of sin, remembering an invisible crown placed on your head as a sign that you are a child of the King would serve to be quite beneficial. It’s easy to forget that we are important to God sometimes. There are days when others may seem to be pointing out a good many of our flaws and failures. There are days that we do that to ourselves, succumbing to the thought that we are useless and worthless. The truth is, as children of God, that is NEVER the case. Be encouraged today that you are important to God. As a believer, we can always remember our invisible crown–a crown of forgiveness and love. Today, I received a card while at work. The shiny and cheerful flowers in the front were a nice introduction to the kind words inside. It was the second card I had received at work in less than a week’s time. Both cards are still on my desk and will most likely remain there. I am loved and I have people in my life who want to encourage me. Is there someone you know that needs some encouragement today? Why not write a quick note or email to them? Send them a card or leave one on their desk at work? 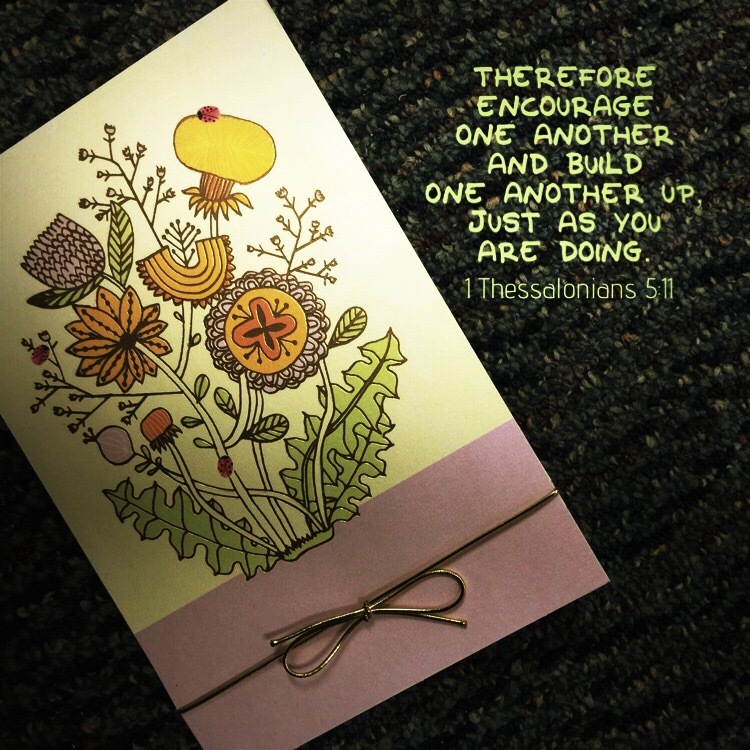 God wants us to build each other up, don’t you agree? Would you like to be at perfect peace? Today, I heard someone say a little phrase that caught my attention immediately. When situations come up that are troubling and crushing to our hearts concerning others that we love, we can direct our thoughts and prayers to God. When we look to God in praise and with intercession, we “fix” our eyes on Him. Don’t focus on decorating your exterior by doing your hair or putting on fancy jewelry or wearing fashionable clothes; let your adornment be what’s inside—the real you, the lasting beauty of a gracious and quiet spirit, in which God delights. Have you ever met someone who looked good on the outside, but what was inside kept you away from them? Have you ever met someone who did not look particularly nice at all on the outside, but what was inside made you consider them beautiful? Clothes, jewelry, haircuts—those are temporary things that don’t show who we really are. How we act and what we say (which mirror the attitudes of our hearts) are our most important adornments, when we are honoring God with our words and deeds. 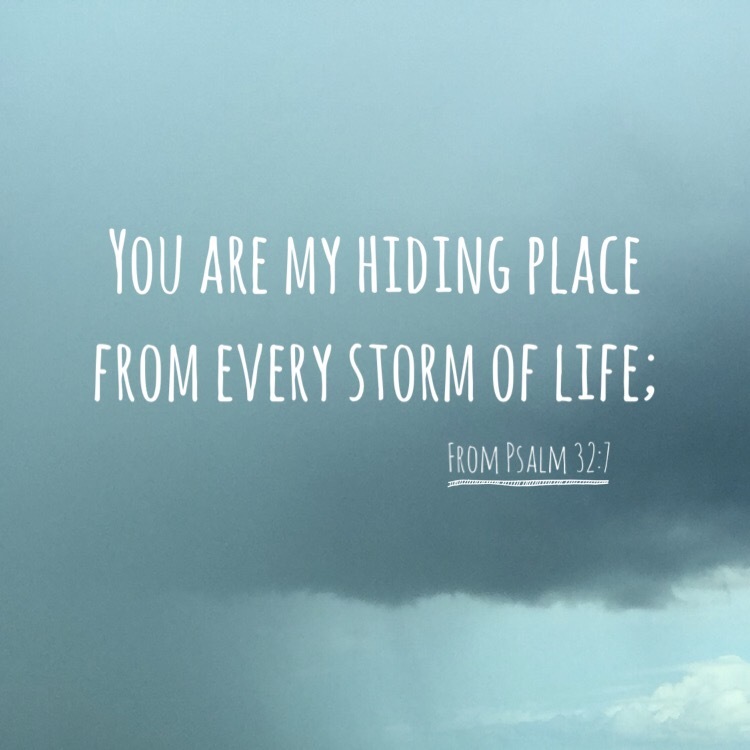 You are my hiding place from every storm of life; You even keep me from getting into trouble! You surround me with songs of victory. This morning, my mind was filled with great thoughts of concern over a loved one. As I drove to work, I prayed about the matter, almost constantly. I usually have music on while I drive, and today was no different. A song titled, “And That My Soul Knows Very Well” came on. The sun was just about to come up, as it was very early. My heart was heavy with concern as I prayed. Suddenly, the blazing light of the rising sun came through a break in the trees behind me and reflected into my rear view mirror. It only lasted a second or so. My face was flooded with bright light from the reflection. I could not escape knowing what had just happened. A message from God that He was with me. When I arrived at work, the parking lot was crowded. I parked in a different place than I normally do. As I was getting ready to get out of the car, the sun was coming up over the building in front of me, once again bathing me in dazzling light. I decided to take a photo of the sunlight with my cell phone. God knows what my heart is longing for and the concerns that I have. 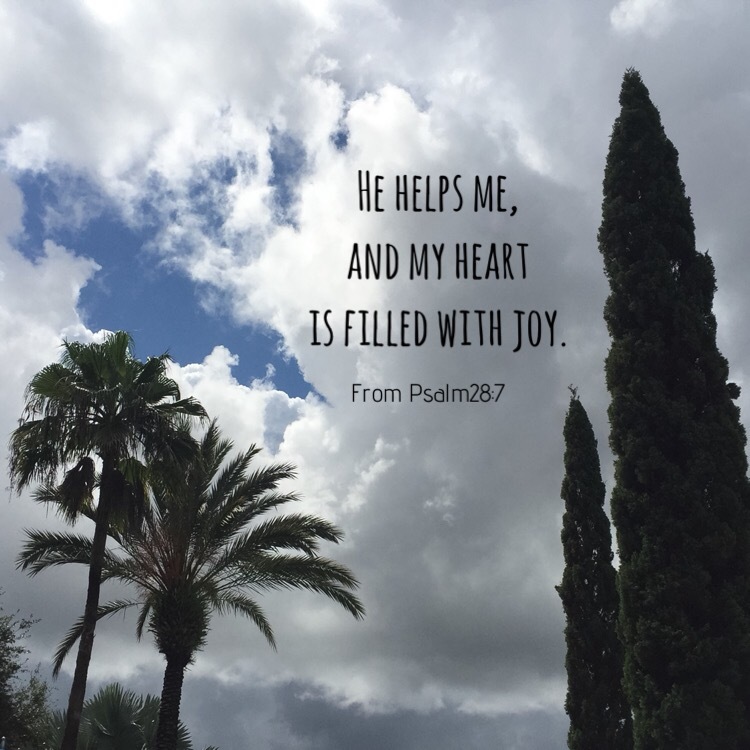 He is with me, and He is with you, too…. I have a favorite scenic place about a thirty minute drive from my home. Serene and lovely, the still waters beckon me to be calm, as well. Our hearts will forever be in a state of unease and confusion until we open them to Jesus. When we do, He will give us rest. There is a metal cross placed in my yard. Whenever someone visits me and notices the cross, there is no mistaking what it represents. Jesus loved us when He gave Himself for us on the cross. He loves us today and He will always love us. Have you ever had a birthday party? Chances are, when you walked into the room everyone cheered and began to sing joyfully. They were celebrating your special day. Your friends were truly happy for you. 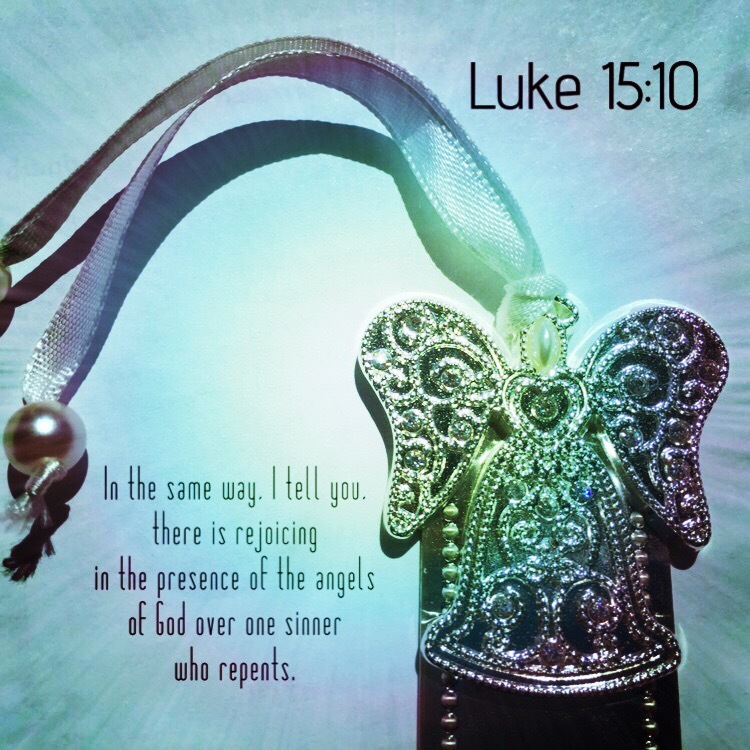 If you know Jesus as your Savior, there was rejoicing in Heaven the moment you repented of your sins and asked for forgiveness. Can you just imagine the scene? Like a birthday party, they were truly happy in celebrating your special day–the day you entered God’s eternal salvation. God sent Jesus to the world to pay the price for our sins, purchasing a place for us in Heaven. Now, that’s something to rejoice about! I understood the context within the news report. If you are a person who lacks integrity, people will not want to listen to you even when you are telling the truth. Apart from the situation surrounding the report I was reading, this statement just speaks to me. How do people view me personally? Would they say that I am a person of integrity? Do they know me as someone who tells the truth? Someone who treats others with respect? Someone who is kind to others, even in difficult situations? Most importantly, would they think that I am someone who is hoping to please God? If I am viewed as being a person of integrity, might others then listen if I tell them the truth about Jesus and His gift of salvation? If I am viewed as being hypocritical and wavering in my day to day life, will anyone really take me seriously when it comes to matters of faith? 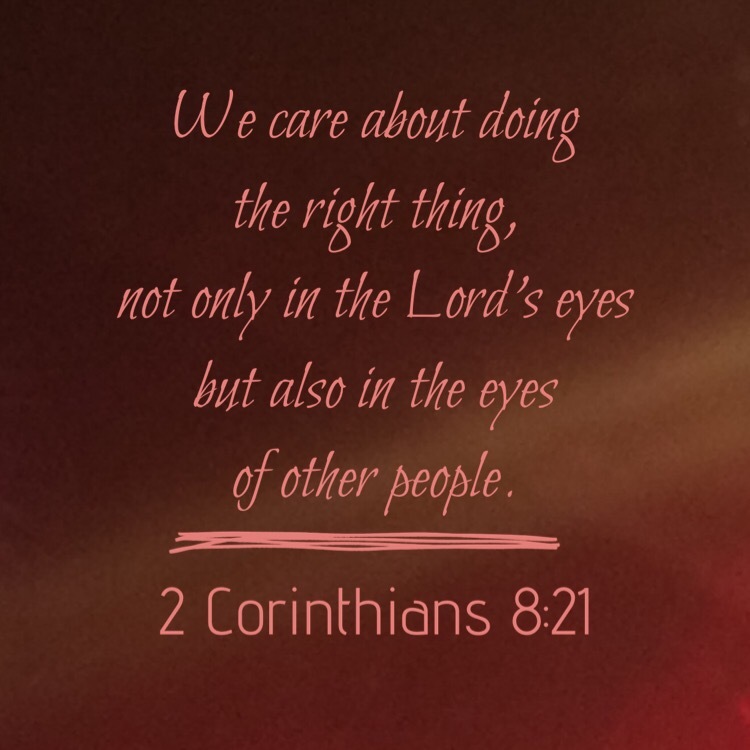 We care about doing the right thing, not only in the Lord’s eyes but also in the eyes of other people. What would it be like if you had a broken vase in your home? What if it was broken while on it’s special place in the center of a table and then moved to a corner—what would that be like? If the entire room was clean, straightened, and put in place, likely you would still think about the broken vase in the corner. Even if everything in the room was right, the broken vase would still come to your mind and you would want to fix it somehow. There might be those who would simply sweep up the broken pieces and throw them away. The vase is valuable, and to discard it would be very painful. The problem is, you do not have any means to fix the vase and you do not have the skill. The delicate shards are sharp and in need of a fine glue, a glue that you do not possess. Although visitors might come and go from your home and never notice the broken vase, you always remember that it is there. That’s what it would be like. The situation would seem hopeless. But what if someone with the special glue could be found who knew just how to repair it? Someone who could restore your precious vase? You may not have a broken vase in your home, yet there is likely something broken in your heart. There is a relationship with someone that is in pieces. The fractured segments lay in sharp and broken shards. There are those who would forget the relationship, be it one with a spouse, a child or a parent. The relationship with the person is like the person themselves—valuable and irreplaceable. The problem is, you do not possess the skill or have the proper means to put the relationship back together. You’re only hope IS the only hope—-Jesus. He can truly mend broken hearts. You must bring the broken pieces to Him in prayer, and ask for healing and restoration. 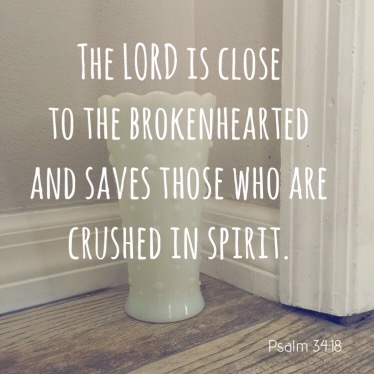 Do you have a broken vase in the corner today? Let’s bring them to Jesus. Dear friends, let us practice loving each other, for love comes from God and those who are loving and kind show that they are the children of God, and that they are getting to know Him better. But if a person isn’t loving and kind, it shows that he doesn’t know God—for God is love. How can I practice loving someone else? In what ways can I be loving and kind? By what actions and words can I show that I am a child of God? How will those who are around me tell that I am getting to know God better? 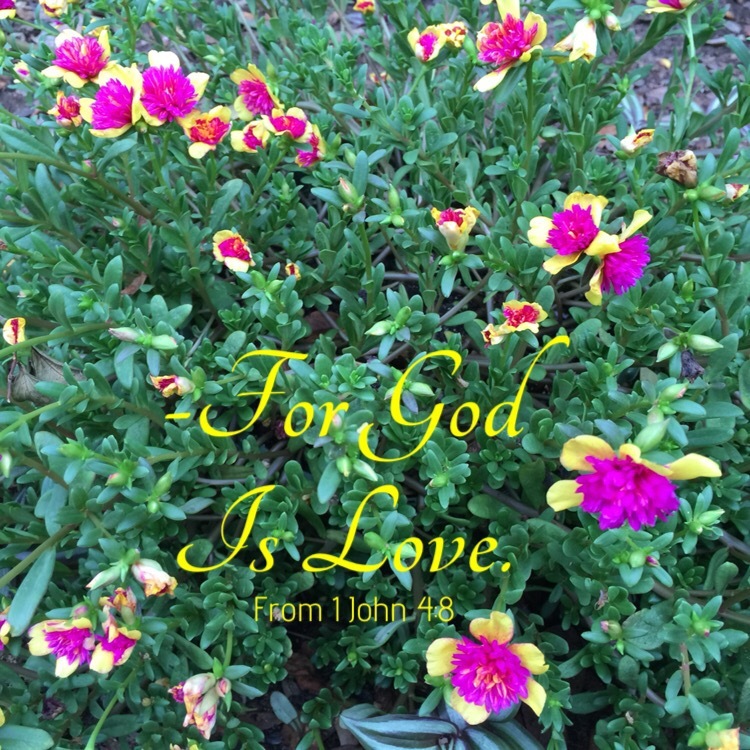 How can my life show others that God is love?